1. The White House. Remarks by the President on Border Security and Immigration Reform. June 30, 2014. http://www.whitehouse.gov/the-press-office/2014/06/30/remarks-president-border-security-and-immigration-reform, retrieved July 2, 2014. 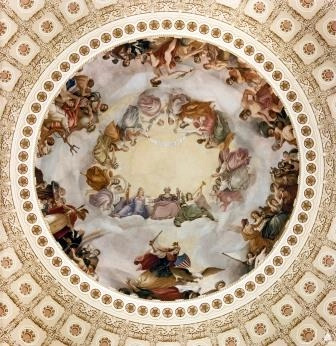 Photograph of the Center Section of the Mural, The Constitution, by Barry Faulkner, 10/27/1936. National Archives and Records Administration. Fireworks picture by Jon Sullivan [Public domain], via Wikimedia Commons. 1. Congressional Progressive Caucus. CPC Co-Chairs Applaud Occupy Wall Street Movement. October 4, 2011. http://cpc.grijalva.house.gov/hot-topics/cpc-co-chairs-applaud-occupy-wall-street-movement/, retrieved July 6, 2014. 2. Representative John Lewis. Rep. John Lewis Speaks Out in Solidarity With Occupy Wall Street Movement. October 7, 2011. https://johnlewis.house.gov/press-release/rep-john-lewis-speaks-out-solidarity-occupy-wall-street-movement, retrieved October 7, 2011. 3. Public Law No. : 112-98, Federal Restricted Buildings and Grounds Improvement Act of 2011. http://www.gpo.gov/fdsys/pkg/PLAW-112publ98/content-detail.html, retrieved July 6, 2014. 1. Homeland Security. Secretary Napolitano’s Remarks on Smart Effective Border Security and Immigration Enforcement. October 5, 2011. https://www.dhs.gov/news/2011/10/05/secretary-napolitanos-remarks-smart-effective-border-security-and-immigration, retrieved July 9, 2014. 4. Department of Homeland Security. Readout of Secretary Johnson’s Visit to Texas. January 21, 2014. http://www.dhs.gov/news/2014/01/21/readout-secretary-johnson%E2%80%99s-visit-texas, retrieved July 9, 2014. 6. Office of National Drug Control Policy. Office of Public Affairs. “FACT SHEET: Strengthening Border Security.” April 5, 2013. p. 1. 8. The White House. Remarks by the President on the Economy, Denver, CO. July 9, 2014. http://www.whitehouse.gov/the-press-office/2014/07/09/remarks-president-economy-denver-co, retrieved July 10, 2014. 1. Congressman Tony Cardenas (D-CA). Congressional Hispanic Caucus. CHC Stands Up for Unaccompanied Minors. July 11, 2014. http://chc-hinojosa.house.gov/press-release/chc-stands-unaccompanied-minors, retrieved July 13, 2014. 3. The White House. Remarks by the President at DCCC Dinner. July 9, 2014. http://www.whitehouse.gov/the-press-office/2014/07/09/remarks-president-dccc-dinner, retrieved July 13, 2014. 4. The White House. Remarks by the President on a New Beginning. June 4, 2009. http://www.whitehouse.gov/the_press_office/Remarks-by-the-President-at-Cairo-University-6-04-09, retrieved July 13, 2014. 1. The White House. Remarks by the President at a DNC LGBT Gala. June 17, 2014. http://www.whitehouse.gov/the-press-office/2014/06/17/remarks-president-dnc-lgbt-gala, retrieved July 16, 2014. 2. Congresswoman Jan Schakowsky. Rep. Schakowsky Reintroduces the Fairness in Taxation Act. April 25, 2013. http://schakowsky.house.gov/press-releases/rep-schakowsky-reintroduces-the-fairness-in-taxation-act/, retrieved July 16, 2014. 4. The House Democrats. Chairman Xavier Becerra: Time To Build Together On Strong June Jobs Report. July 3, 2014. http://www.dems.gov/chairman-xavier-becerra-time-build-together-strong-june-jobs-report/, retrieved July 17, 2014. 5. Speaker of the House John Boehner. Memo to House Colleagues on the Separation of Powers. June 25, 2014. http://www.speaker.gov/general/memo-house-colleagues-separation-powers, retrieved July 17, 2014. Photograph of Mount Rushmore courtesy National Park Service. 1. The White House. Administration Officials Announce U.S.-Mexico Border Security Policy: A Comprehensive Response & Commitment. March 24, 2009. http://www.whitehouse.gov/the_press_office/Administration-Officials-Announce-US-Mexico-Border-Security-Policy-A-Comprehensive-Response-and-Commitment, retrieved July 20, 2014. 2. The White House. Joint Press Conference With President Barack Obama and President Felipe Calderon of Mexico. April 16, 2009. http://www.whitehouse.gov/the_press_office/Joint-Press-Conference-With-President-Barack-Obama-And-President-Felipe-Calderon-Of-Mexico-4/16/2009, retrieved July 20, 2014. 3. Congressman Luis V. Gutierrez. Rep. Gutierrez Counts Down Days Republicans Have to Change History and Avert George W. Bush Being the Last Republican President…Ever. May 20, 2014. https://gutierrez.house.gov/press-release/rep-guti%C3%A9rrez-counts-down-days-republicans-have-change-history-and-avert-george-w-bush, retrieved July 20, 2014. 5. Congressman Joe Garcia. Representative Joe Garcia’s Statement on House Republicans’ Refusal to Act on Immigration Reform. July 10, 2014. http://garcia.house.gov/media-center/press-releases/representative-joe-garcias-statement-on-house-republicans-refusal-to-act, retrieved July 20, 2014. 6. The White House. Statement by the Press Secretary on the Visit of the Presidents of Guatemala, Honduras and El Salvador. July 18, 2014. http://www.whitehouse.gov/the-press-office/2014/07/18/statement-press-secretary-visit-presidents-guatemala-honduras-and-el-sal, retrieved July 19, 2014. 1. Photo by S. Clyde. Courtesy U.S. Department of Transportation. Federal Highway Administration. 2. U.S. Department of Education. New Initiative to Provide All Students Access to Great Educators. July 7, 2014. http://www.ed.gov/news/press-releases/new-initiative-provide-all-students-access-great-educators?src=rotator, retrieved July 23, 2014. 3. U.S. Department of Justice. U.S. Department of Education. Dear Colleague Letter on the Nondiscriminatory Administration of School Discipline. January 8, 2014. p. 6. 5. U.S. Department of Education. New Initiative to Provide All Students Access to Great Educators. July 7, 2014. http://www.ed.gov/news/press-releases/new-initiative-provide-all-students-access-great-educators?src=rotator, retrieved July 24, 2014. 1. A semi-automatic weapon, assault rifle magazines and ammunition are discovered by Tucson Border Patrol agents as they searched suspected smugglers. Courtesy U.S. Customs and Border Protection. http://www.cbp.gov/newsroom/local-media-release/2009-04-28-040000/border-patrol-agents-arrest-22-interdict-guns, retrieved July 27, 2014. 2. Perez, Juan Jr. “Mayor wants Chicago to shelter young immigrants.” Chicago Tribune. July 26, 2014. Web. July 27, 2014. 1. Carl Levin. Responsible Tax Reform. http://www.levin.senate.gov/issues/responsible-tax-reform, retrieved July 31, 2014. 2. Sullivan, Sean. “Sheldon Adelson, Warren Buffett, Bill Gates press Congress to pass immigration reform.” The Washington Post. July 11, 2014. http://www.washingtonpost.com/blogs/post-politics/wp/2014/07/11/sheldon-adelson-warren-buffett-bill-gates-press-congress-to-pass-immigration-reform/, retrieved July 31, 2014. 3. The White House. Remarks by the President on the Economy – Kansas, City, MO. [sic] July 30, 2014. http://www.whitehouse.gov/the-press-office/2014/07/30/remarks-president-economy-kansas-city-mo, retrieved July 31, 2014. 4. Nancy Pelosi. Pelosi Floor Speech in Opposition to Republican Supplemental Appropriation Bill. July 31, 2014. http://www.democraticleader.gov/newsroom/pelosi-floor-speech-republican-supplemental-bill/, retrieved July 31, 2014. 5. The White House. Remarks by President Obama After Meeting with Central American Presidents. July 25, 2014. http://www.whitehouse.gov/the-press-office/2014/07/25/remarks-president-obama-after-meeting-central-american-presidents, retrieved July 31, 2014.